This week, I add another installment to our Wedding Flowers Your Way series, featuring Cake Decorations. I’ve included two easy and creative ways to decorate a classic two tier cake. Wedding Flowers Your Way is a series of lessons that provide simple, easy and creative ways to create wedding flowers. 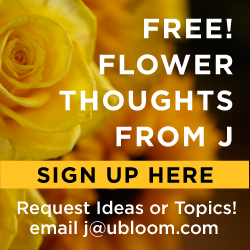 You can check out the other Wedding Flower Lessons here… https://ubloom.com/flowers/video/wedding-flower-lessons/ Subscriptions to uBloom are $3.99 per month for unlimited access- and ANNUAL Subscriptions are $38.40. You can get an additional 20% off the Annual Rate with code “UBLOOMLUV” – and keep that rate forever if you tick “Auto-renew”…That way, you keep your savings coming for years to come! If you’re interested in purchasing the Gala® Bouquet Holder featured in many of the Wedding Lessons, visit www.uBloom.com/BuyGala and have it shipped to your door!